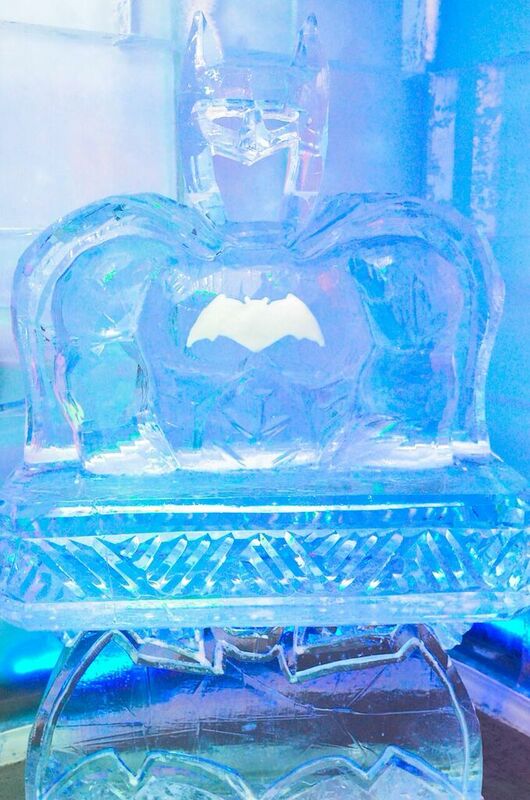 Review Fix chats with Rupert King, General Manager of the Minus5 Ice Bar in Monte Carlo Las Vegas and ice sculpture artist Kurt Herbolsheimer to discuss the nifty new Batman and Superman ice sculptures at the bar. Breaking down the inspiration for the display and even a few cool cocktail ideas, the two make us want to hop on a plane now for some chilly drinks and geeky fun. Created in New Zealand in 2001, Minus5 Ice Bar is a unique ice-themed experience where guests can enjoy quality vodka cocktails served in a glass made of 100% pure ice, all within the beauty of a -5° Celsius (23° Fahrenheit) stunning ice environment. This icy experience begins with donning Minus5 parkas and gloves, then entering a fully frozen attraction, complete with walls, tables, benches and a bar made completely of ice. Guests are surrounded by a variety of intricate works of art, carved out of pristine ice, and created by some of the country’s most award-winning ice carvers. The experience is rounded out with a state-of-the-art sound and LED light show, providing much more than just a place to grab a cold cocktail. It’s a true entertainment experience. Upon exiting, guests can purchase permanent memories of their time spent at Minus5 Ice Bar including high-quality logoed clothing, framed photographs and other cool merchandise. To learn more, visit www.minus5experience.com. Review Fix: What inspired the ice sculptures? Kurt Herbolsheimer: We wanted to do something fun and interactive for our guests that would correspond with the movie. We figured nothing would be more fun than “being” Batman or Superman, even if only temporarily. Review Fix: Have you guys added any signature Batman/Superman cocktails as well? Rupert King: We have not added any drinks as of yet. We do a monthly celebrity cocktail series. We invite a celebrity to our venue and create a cocktail for them and offer it as a special throughout the month. If Ben Affleck or Henry Cavill want to stop by I will be adding the “Dark Knight” and the “Kryptonite” as two specialty drinks. · “Dark Knight” = Skyy Ginger Vodka, Pyrat Rum and a splash of beer. · “Kryptonite” = Don Q anejo rum, Don Q coconut rum, melon liquor and pineapple juice. Review Fix: How, if any way, have DC Comics been involved with you guys on this? Review Fix: How have patrons responded to them? King: So far the sculptures have been extremely popular. Almost everyone gets behind the Batman sculpture and does an impression of Batman. Then they hop over to the Superman sculpture and turn their head to the right for that quintessential Superman pose. Review Fix: How long will they be at the bar? King: Traditionally sculptures are in the bar for 6-8 weeks. However, these are very popular and we might extend their time. Review Fix: Who’s your pick in a fight, Batman or Superman? Why? King: In my opinion, there is no fight. Superman would win hands down. Bruce Wayne is a crafty man that has learned a myriad of skills that make him an excellent vigilante. He has the gadgets that everyone loves and every kid wants. However, Batman is not a Superhero. He has no actual super powers, at the end of the day, he is just a man doing what he thinks is best to save his city. Superman has superpowers: the ability to fly, x-ray vision, tornado breath and heat vision from his eyes to name a few. Herbolsheimer: Superman without a doubt. He’s the Man of Steel, no mortal man has a chance.